This classic tree of life tapestry "Tree of Life Brown III" shows the immortal tree based on the work of William Morris, on a brown background. The red flowers and green vines add color and vivacity to the piece, which is a wonderful work of composition and color. The peach star shaped flowers add a flurry of activity to the piece, as does the vine and flower border. The attention to detail is gorgeous in the tree trunk, branches and leaves with all components hgihlighted in various shades, a masterful technique of the master artists from the Renaissance onwards. 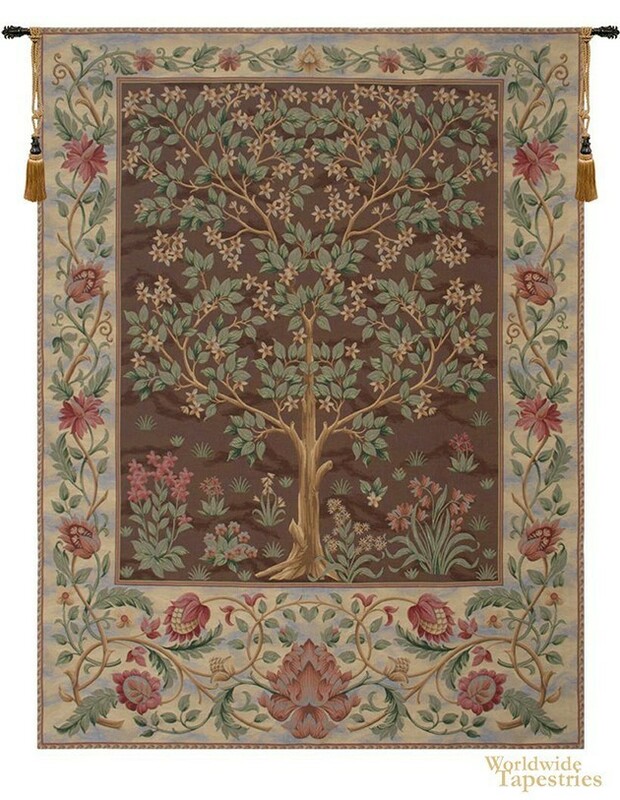 This tree of life tapestry is backed with a lining and a tunnel for easy hanging. Note: tapestry rod, tassels and accessories, are purchased separately. Dimensions: W 55" x H 73"